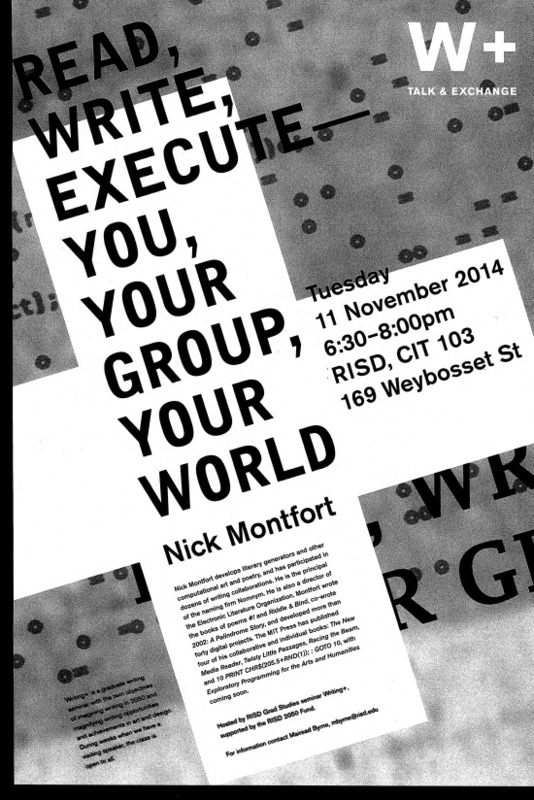 Nick Montfort develops literary generators and other computational art and poetry, and has participated in dozens of writing collaborations. He is the principal of the naming firm Nomnym. He is also a director of the Electronic Literature Organization. Montfort wrote the books of poems #! and Riddle & Bind, co-wrote 2002: A Palindrome Story, and developed more than forty digital projects. The MIT Press has published four of his collaborative and individual books: The New Media Reader, Twisty Little Passages, Racing the Beam, and 10 PRINT CHR$(205.5+RND(1)); : GOTO 10, with Exploratory Programming for the Arts and Humanities coming soon.